When companies start throwing around billions of dollars in a bidding war, we tend to pick our heads up from our phones to see what all the fuss is about. In this case, Palm overlords HP kept throwing in more chips until Dell folded, winning the pot containing cloud storage firm 3PAR at the cost of $1.5 billion. 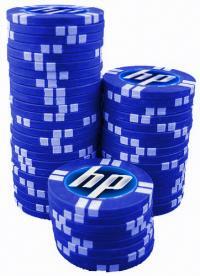 HP’s bid came in at nearly $500 million higher than Dell’s best offer. So what is all the fuss over 3PAR? It turns out that despite their lack of profit over their decade-long existence, 3PAR has managed to push the envelope in cloud computing and storage. With both HP and Dell aggressively expanding their services divisions, 3PAR looked to be an attractive acquisition. As with HP’s purchase of Palm, there’s a lot of potential in 3PAR’s intellectual property, and all it needed was the kind of application of dollars that HP can provide. While it seems pretty clear that HP’s intent with the 3PAR purchase is to expand the offerings of their Enterprise Services division, we can’t help but imagine/hope that this could also be tied to Palm and webOS. With its heavy cloud dependency, robust cloud storage and power is of high importance to webOS. In fact, if HP’s right about Palm and that all they needed was dollars to make the changes needed to bring in the millions of customers previously hoped for, then Palm’s servers are going to need some serious upgrading anyway. And who knows what sort of cloud-based services webOS 2.0 might end up supporting; this 3PAR acquisition could end up being more important for Palm and webOS than it seems on the surface. Of course, the acquisition is still contingent upon approval of the bid by 3PAR’s shareholders (the company went public in 2007). And if the sudden rise in 3PAR’s stock price is any indication - up an astounding 45% today alone - investors expect that Dell may up the ante and counter-bid HP’s impressive offer. Source: Reuters; Thanks to everybody that sent this in!